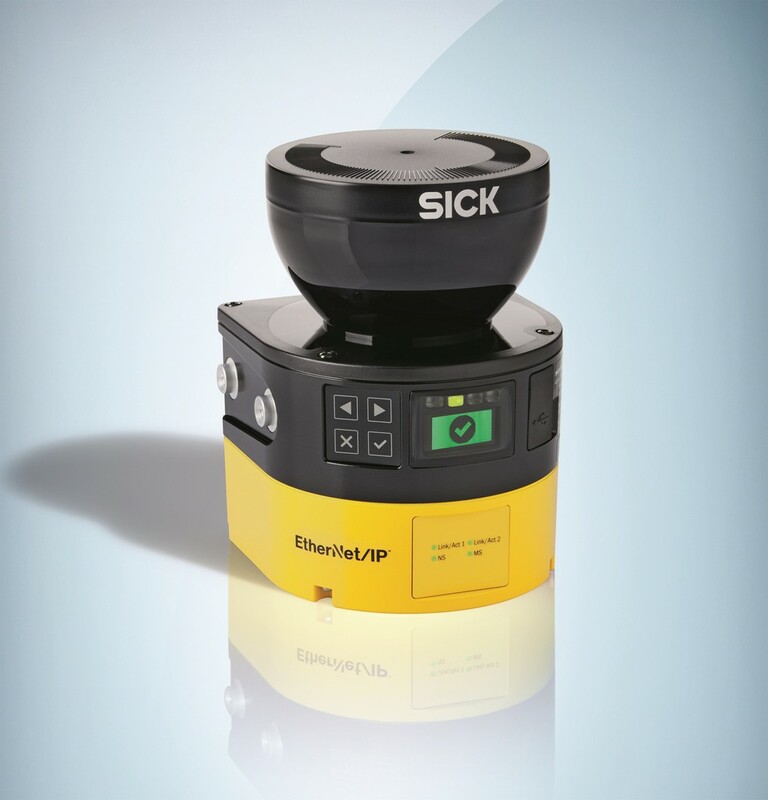 SICK has expanded its next-generation microScan3 family with the addition of EtherNet/IPTM and PROFINET compatible variants to enable easy integration of safety laser scanners into a safe network. This also facilitates simultaneous field evaluation of up to four fields, instead of the single field offered by standard I/O scanners.The SICK microScan3 Core – EtherNet/IP is the first safety laser scanner to support CIP Safety over EtherNet/IP and the microScan3 Core – PROFINET enables safe and reliable bus communication using the PROFIsafe protocol over PROFINET. When it was launched in 2016, the compact and robust SICK microScan3 safety laser scanner set a new benchmark for performance reliability with its market-leading safeHDDM (High Definition Distance Measurement) scanning technology. Its patented algorithms use multi-signal evaluation to achieve outstanding performance even in challenging environments with robust resistance to dust, dirt, and high-ambient light conditions even when detecting objects with low remissions, for example black clothing. “Both network-compatible microScan3 options provide excellent protection especially where single field scanning is difficult, for example at corners, in two or three-sided access to hazard areas, or where light curtains are obtrusive or prone to impact damage. With the additional versatility offered by network compatibility, users can save on purchasing costs and further improve their productivity. Integrating the new microScan3 scanners into existing safe controllers and control cabinets is straightforward and the scanners can be configured over the network quickly for ease of set up and rapid device replacement. The SICK microScan3 Ethernet/IPTM and PROFINET both feature a bright, multi-coloured LED display for on-site teach-in and status monitoring and SICK’s configuration software, SafetyDesigner, enables rapid and intuitive set-up of fields via a guided choice menu and a simple interface. Using the microScan3 over a safe network also provides the means to access a wide range of additional information such as multiple warning fields, contamination signals and enables simple field switching without additional wiring. The bright multicolour LED can provide sensor status and diagnostics information and can be viewed and read even from wide angles or at a distance, with clear text and instructions about required actions helping with maintenance and fault finding. The safety laser scanners are protected against unauthorised manipulation in service by transmitting a checksum of the safety configuration, which allows users to detect and trace any unauthorised changes made to the device. This gives peace of mind that applications continue to be safe in the field. SICK microScan3 has a lightweight, rugged metal housing with vibration resistant brackets, enabling easy installation and adjustment. M12, 8-pin connectors, mini USB interface and system plug with integrated configuration memory ensure simple, low cost, smart connectivity.